Above is a picture of The Saddle in the early morning sun, taken from the lounge window. Woodlands is an affordable, budget, holiday home situated at the head of the awesome Glenshiel in the shadow of the five sisters of Kintail. Despite its low tariff (at full capacity, it ranges from only £75 per person, per week off season, to £105 per person per week high season), Woodlands is a spacious and extremely comfortable, well-equipped, large, holiday cottage with spectacular views. There are 21 Munros in its vicinity (the Five Sisters and Saddle being accessed direct from the house! ), so it is perfect for hillwalkers and ramblers. It is also ideal for families with children. With pool and basketball on offer plus many board games, children love the house and what it has to offer (happy, occupied children = happy parents!). Of course, many adults enjoy these pastimes too. Just around the corner (but not visible from the house) is the gorgeous Loch Duich which is free to fish. Pony trekking is nearby. For those wishing to tour by car or by motorbike it is extremely well-located for touring most of the Highlands and Islands. Finally, Woodlands' atmosphere, size and layout is great for large get-togethers. As previously mentioned,Woodlands is a fantastic base for climbers, walkers and tourers. Apart from the multitude of Munros in Glenshiel itself, many other mountain ranges are reachable from Woodlands - the Cuillen hills, Knoydart, Glenelg, Torridon, the Ben Nevis range and Glen Affric. In addition, Glencoe is less than two hours away. For those who prefer to not go to such heights, there are countless mid and low level walks. Ramble through forests and isolated glens, wander alongside tumbling burns and cascading waterfalls, stroll along the banks of tranquil mountain lochs, or explore the miles of coastline the North West is famous for - all virtually on the doorstep! Being on the A87, Woodlands is also extremely well-placed for touring the Highlands and Islands. 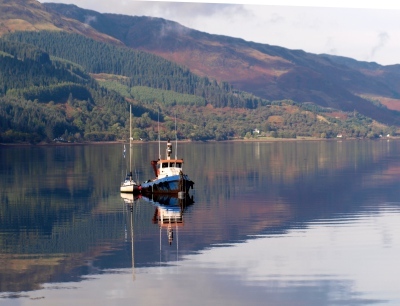 Enjoy the peace and tranquility of Applecross accessed via the highest road in Scotland or take a cruise along Loch Ness and visit Urquhart Castle. Closer to home there is the dramatic Eilean Donan Castle, the glorious Glenelg peninsular with its Iron Age brochs, the delightful Plockton or you may fancy going over the sea to Skye. Take a seal trip, sail in a glass-bottomed boat, go boating, pony trekking, mackarel fishing or just relax in the house and enjoy the views. Again, as mentioned before, children love Woodlands. Apart from pool, basketball and many board games, there is half an acre for them to run around in plus woodland to explore behind the house (please note - this is a rugged garden befitting the surrounds. Small children will need supervising as one third of the garden is steep and a small spring flows down the hillside). When they are finally tired at the end of a hard day's playing, there is a TV, Video and DVD player. Lastly, the 10-seater dining table attracts adults like moths to a flame and the huge lounge is perfect for socialising. Families scattered to the four corners of the earth have reunited under Woodlands' welcoming roof. House with large rooms in stunning glen - This is our second stay which says it all. The kitchen has a big table and the lounge is large with many sofas making it great for a large party. Four bathrooms and an effective heating system are handy too when everyone returns from the hills. Glen Shiel gives Glencoe a run for its money when it comes to awesome beauty and choice of Munros, but fewer tourists. Breath taking views and a cosy cottage - The cottage and location are spectacular. There is so much to do with trips to Skye and traditional music at the local pub.I was blown away with how cheap it was and that it sleeps 12 people. The house was huge and had plenty space for 12 adults. Would love to go back for another holiday there. A place worth coming back to again and again! - I first stayed at Woodlands in 2008 with a philosophy reading party that has come back every year since. Everything that 'Captain Philosophy' says about the cottage in his gushing review from 2009 is still true, and the place keeps getting better in small but useful ways - this time round, for instance, I was pleased to find a coffee grinder in the kitchen. Paula has always been friendly, helpful, and (where necessary!) understanding. So much so, in fact, that when we arrived at the cottage this Easter, we found that she'd left us a card and a bottle of whisky in honour of 'Captain Philosophy', who died in August - a touching gesture that we greatly appreciated. In short, if you're a largish group of people who want to spend a week in the Highlands, I can't imagine you'll find anywhere better equipped, better located, better priced, or better managed than Woodlands. I'm very glad we found it. Great house surrounded by nature - We stayed in this house during our holidays in Scotland. We visited Skye, Eilean Donan castle, the Loch Ness, and did some walks near the house. Everybody loved it. The house is very big, with plenty of room: we were a 9 people group, but the house can easily accommodate bigger groups. The heating worked perfectly, the rooms were nice and comfortable, more than enough bathrooms for everybody, and huge kitchen and living room.The owner was very helpful, and gave us lots of information about activities. I would definitely recommend this house to big groups. Fantastic Christmas in a wonderful, cosy cottage! - Woodlands cottage is a lovely, cosy cottage, ideal for a big family get together. We had a lovely Christmas week there. Spectacular scenery, fantastic living room with open fire, which just looked amazing on christmas morning covered in Christmas presents. The huge kitchen table provided the perfect setting for Christmas dinner and many more lovely home cooked meals, in the best equipped self catering cottage I have ever been in. We all fell in love with both the cottage and the area. Would highly recommend the long but simply breathtaking drive to Applecross ( over the mountain pass weather permitting or coastal route). Would recommend doing a big shop in the Tesco/Morrisons in Inverness or getting Asda delivery as catering for a large number of people using the small, local shops would be tricky/expensive. We are already planning a trip back up to Woodlands with friends. Fabulous house for large family holiday - Woodlands cottage glenshiel,has everything you will need for a great time, on your door step is the loch,with pony trecking just 5 minutes away.and a wee trip to plockton,you can take callums boat,to see the seals, and not to far is the beautiful Island of Skye.and to top it all a must is a visit to Applecross the highest road in the uk, would definitely recommend this cottage. Loved every minute - We were captivated straight away by the magnificent scenery surrounding the house. Waking up to beautiful views every morning and star gazing every night in the midst of the munro's was heavenly. The house enhanced our holiday, it was clean, well maintained with a home from home feel. Everything we needed was provided for. With 14 people (6 of those being little) there was plenty of room and no queues for bathrooms. The kids (ages 2-10) never got bored and there was plenty of space for everyone to have a seat in the living room and kitchen. The owner has been great to communicate with quick responses too. A great help! We all enjoyed the surrounding areas. Eilean donan castle, the glass bottom boat in Kyle of Lochalsh, Isle of skye and a visit to Plockton were the activities when our party weren't hiking and exploring the area and munro's around the house. We would highly recommend this guesthouse, and hope to be able to stay again in the future. Excellent location - Second time we have stayed here (group of 12). Location couldn't be better for days out on the Glen Shiel and Kintail Munros. Warm and comfortable. Wouldn't hesitate to book again. Lovely - Charming cottage set amidst a spectacular mountain landscape. The people we rented the cottage from were very pleasant as well. The nicely decorated interior, comfortable sleeping arrangements and an excellent price meant that our stay was a real treat. There's no place I'd rather be!